It is also called Old Church Slavonic or Old Slavonic language, and represents a tongue which was spoken by South Slavic tribes who invaded the Balkan peninsula in the 6th and 7th century AD. These people further settled here under names of Bulgarians, Serbs and others, and so Old Church Slavonic may be also called Old Bulgarian. 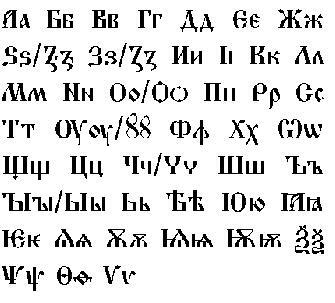 Saints Cyril and Methodius, who invented famous the Cyrillic and Glagolitic alphabets, worked as missionaries in South Slavic lands, and for these purposes they, naturally, need the Bible written in the aboriginal language. That is how the written Old Church Slavic appeared. It was never a colloquial tongue - no ordinary people spoke it, but all literature, church liturgy, verses and prayers were in Church Slavic. It was an official written language in Czech, Moravian, Bulgarian, Serbian, Russian and Lithuanian lands for ages, until it was replaced by Catholic Latin somewhere (in Bohemia), or by national languages (in Russia). But still, even now the official language of the Russian Orthodox church is that very Old Church Slavic, so we cannot consider it extinct or dead - it is widely used for liturgical purposes. The language is archaic in its structure. Seven cases, including vocative, three numbers with dual, three genders and a lot of inflections. Phonetics has a number of differences from Russian or any other modern Slavic language: more archaic sounds, numerous vowel and consonant interchanges inside the stem of the word, etc. Adjectives can be short (simple) and complex (pronominal). The most complicated is the verb system, including many tenses such as aorist, imperfect, plusquamperfect (past perfect), two different future tenses. Also there are conditional and imperative moods, infinitive and supine, several kinds of participles.